The spectacular Manchester Cathedral was dressed to impress for the Northern eCommerce awards last Wednesday night, and so was our sales and marketing team. We proudly accepted the accolade for Delivery and Logistics Provider of the Year. This is a fantastic achievement and testimony to the ingenuity and commitment of all our people at Exact Abacus. "This was an impressive entry and stood out in a highly competitive field of entrants. By any measure, the results they have achieved for clients have been outstanding." 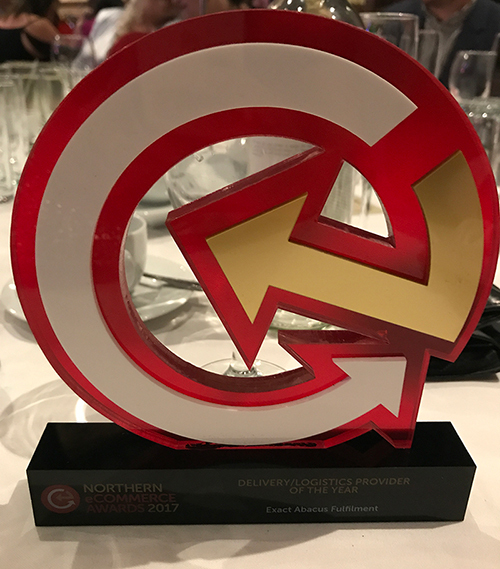 With a commanding lead in software technology, the award affirms our outstanding reputation for order fulfilment services and innovation in multi-channel retail. Our winning entry focused on 2016’s ‘Big Idea’ initiative - ‘Paperless Picking and Dispatch’; a completely revamped warehouse management software designed to reduce waste, increase productivity and ensure the highest levels of dispatch performance, stock accuracy and accountability. The new technology was developed, tested and rolled out across our three fulfilment centres ahead of the busiest trading quarter, during which over 750,000 items were dispatched within SLA. "We have used Exact Abacus software for many years. The logic of the system is fantastic and enables our warehouse to run super-efficiently. The addition of paperless picking and dispatch functionality has taken our operation to another level. During the first crazy Christmas period [using paperless picking] in 2016 we were able to cut down the amount of temporary workers needed by 80% on previous years and despatched all orders on time." With this years ‘Big Idea’ building momentum and the award season heating up, there could very well be further accolades on the way! For more information about the range of fulfilment services and software technologies provided by Exact Abacus click here. We're here to help. Send us a message and we'll get back to you as soon as possible. Is outsourced fulfilment the right choice for your business?